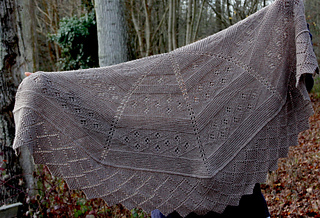 I have named this shawl High Woods Shawl to go with my High Woods hat pattern knit in the same yarn. 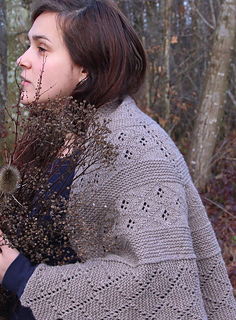 It is a big squishy and a very warm shawl, perfect for wrapping up in cold weather. 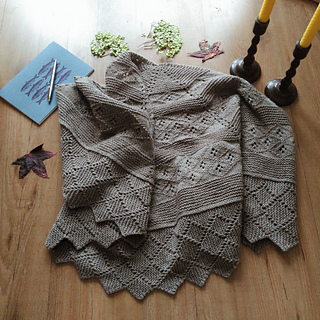 The pattern doesn’t really have any complicated stitches, but does require attention on the diamond pattern sections as there are a lot of knits and purls alternating to create the texture of the shawl. Finished measurements: 146cm wingspan and 61 cm centre depth. I have used 6 skeins of Blue Sky Fibers Woodstock yarn for this shawl. I suggest using solid colored yarn for this project as the texture may get lost in variegated or speckled yarn. I have given the gauge for the pattern above, but of course, as with most shawls, slight gauge variation won’t make much difference. Thank you for choosing my pattern!